On Sunday, August 30th – we held a “Vintage Motorcycle Show” for all bikes 25 years or older. It turned out to be a great day for a bike show as the temperature stayed right around 80°- the sun and clouds alternating throughout the afternoon. The show was scheduled for 1 to 4pm and bikes started showing up to enter around 11:15am. By the time the show started at 1pm we had 71 people signed in- some with multiple bikes. By the time we did the official count, around 3pm- we had 93 bikes including 10 from our own Biker Rags collection. Bikes continued to arrive for the show. The parking lot was filling up with vintage bikes. The crowd really seemed to enjoy seeing all the vintage iron. Aside from the bikes in the show- other bikes could be seen in the adjacent parking lot. A big thank you to Jay and the WIMZ crew for coming out to do a live remote! We had complimentary snacks and pizza for all the entrants- and a “Most Wanted Motorcycle” contest. Each entrant got a vote for the bike they would “most want” to take home that day. Doc Tyler from Knoxville won with a 1950 Vincent, Conard Shultz took 2nd place with a beautiful Triumph chopper and Mike Swenson got 3rd with his 1956 Harley Panhead that he rides on a regular basis. The awards are being announced. Besides these three bikes, there were some other absolutely stunning motorcycles- as well as several “as is” daily rides- and some barn fresh originals. Harleys were well represented, several Nortons, BSA’s, Triumph’s and quite a few Japanese Marque’s. 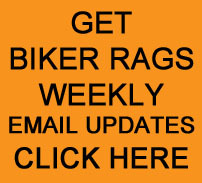 In November, Biker Rags will be celebrating 15 years in business and we will be having another Vintage Show on Sunday, November 8, 2009. If you have a vintage motorcycle- mark your calendar- we would love to have you. Thanks to everyone that brought a bike to the show! And a very special thanks to WIMZ for helping us to promote it. We also want to thank Ken Schwall from WBIR TV who came out and did a piece on our Biker Rags vintage bike collection- and did a preview of the vintage show. CLICK HERE to see the Positively Schwall video. Return to the ARCHIVES page by CLICKING HERE.